I think it's time to show off my latest game. It's based on a very popular game, with some added twists. It's Vortex Battle! Watch out, yellow! Green is about to score a point. 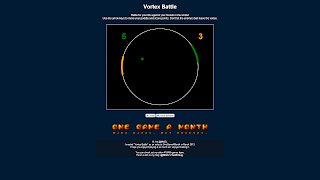 Vortex Battle is played by two people on the same keyboard. The goal is to make the ball leave the Vortex. However, if your enemy was the last to touch it, make sure it doesn't! That might be a little confusing, so there are some graphical hints to help you. The ball is made out of very volatile energy (it isn't, really, but just play along for now) and takes the colour of whatever paddle touched it last. This means that if I'm playing as green and I manage to stop the ball from leaving the vortex, it will now have my colour. If yellow doesn't stop it from leaving the Vortex (the white circle), I will score a point! Currently, the core gameplay is in place. I will be adding powerups later to make the gameplay more challenging. All of the source code will be available freely online. 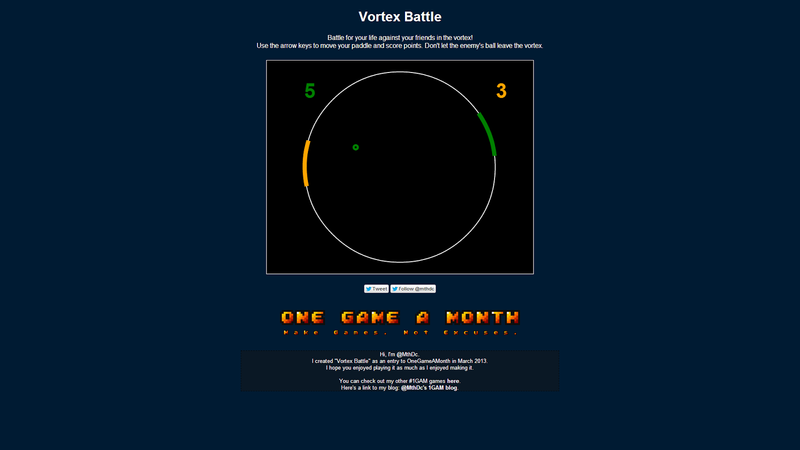 I hope you like what you see and will give Vortex Ball a try! If you have suggestions, comments or questions, please do contact me! By Unknown at 12:33 p.m.